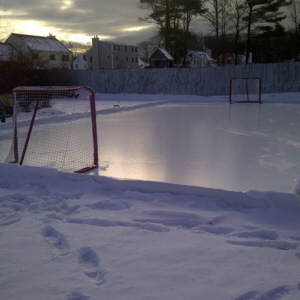 Ice Rink Liner - Type I HR 6 Mil Reinforced Backyard and Commerical Ice Rink Liners | GeoCHEM Inc. TYPE 1 HR LINER COST (UP TO 10,000 SF): $0.13/SF + Freight. TYPE 1 HR LINER COST (10,001+ SF): CALL FOR PRICE OR CONTACT US. Note: Please keep in mind your backyard or commercial ice rink will be smaller than your Ice Rink liner. Estimate an additional 5' of ice rink liner in both width and length to obtain the ice rink size you desire. NOTE: THERE IS A MINIMUM ORDER OF 50 LINEAL FEET X Width AND a Minimum Purchase of $600.00 or More.